Grandson of the photographer Paul de Cordon, Pierre-Elie de Pibrac was born in Paris in 1983. In 2007, he made his first reports at Cuba and in Myanmar. His first images won several prizes and competitions organized by magazines like Paris Match and Photo, or mobile phone companies such as Orange and SFR. In 2009, Pierre-Elie worked side-by-side with leading photographers from the Vu’ agency, such as Denis Darzacq, Claudine Doury and Rip Hopkins. The same year, soon after graduating from a renowned business school, he decided to devote himself fully to photography. Pierre-Elie produced his first large-scale series in New York in 2010 based on the theme of photographic perception and objects. Bearing the titles American Showcase and Les Frontières de la Perception (the Edge of Perception), the project was very well received by the public and press, and resulted in the production of a book called American Showcase, published by Archibooks. The book showcases Pierre-Elie de Pibrac’s emerging trademark: beyond the subject being dealt with, the photographer seeks to transform the image by inventing new concepts with which to make his own mark. The audience discovers a “photographic object” whose aesthetic rendering brings to life a totally unique and puzzling perception. Pibrac exhibits his works in France and abroad in numerous galleries and prestigious venues like the Grand Palais in Paris. His work has also been on display at various fairs such as Cutlog and Paris Show Off during the FIAC! 2010 international modern art fair, the Lille Art Fair in 2010 and the Brussels AAF in 2012. With an ability to move energetically between different photographic realms, the photographer Pierre-Elie de Pibrac decided during the 2013-2014 season to follow the ballet dancers of the Opéra de Paris. Immersed in the life of the dance company and behind the scenes of the Garnier and Bastille operas, he adapted his lens with great sensitivity to the subject at hand. The Confidences series is made up exclusively of black and white photos and films. In the two other series presented as part of this work, he uses colour. By means of a certain technique and new way of seeing, Catharsis highlights the abstract nature of the image. This series is the fruit of research carried out on transcribing the energy emitted by the dancers and spreading it out in space. Ballet’s power is revealed to the audience in a new, transcendental way. Analogia illustrates in 14 works the sustained echo within the walls of the majestic Palais Garnier and the dancers of the ballet company. Photographed with a rigged view camera, this series highlights the immenseness of this theatre and its influence on the dancers who move about within it. The finished product that emerged from it was an exhibition and a most beautiful 368 page book called “In Situ : dans les coulisses de l’Opéra de Paris” (In Situ – Behind the Scenes of the Opéra de Paris), published by Clémentine de la Feronnière. This passionate photographic journey about ballet and the Palais Garnier is enriched with testimonies of étoile dancers and other famous dance personalities. In Situ – Behind the Scenes of the Opéra de Paris was exhibited in Paris during the Mois de la Photo Off 2014, in Miami in 2015 and at Paris Photo Paris and Los Angeles, Zona Maco and Zona Maco Foto fairs in 2015 and Art Wynwood in 2016. From november 2016 to june 2017, In Situ has been showed at La Havana, at the Casa VIctor Hugo. This exhibition was the biggest photo show ever done in Cuba. 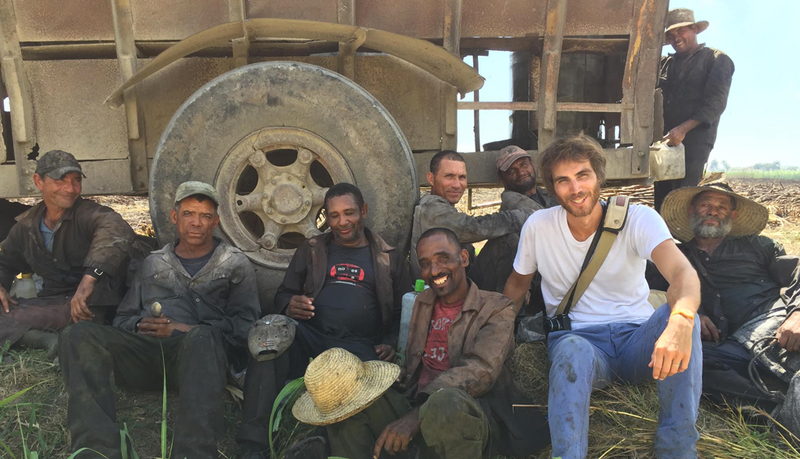 From October 2016 to June 2017, Pierre-Elie de Pibrac spent 8 months with his family in Cuba to realize the Desmemoria project, a testimony, both anthropological and social, about the life of the Azucareros, a people from sugar, living for the sugar and revolutionary of the first hour. Through this testimony Pierre-Elie opens a reflection on the identity of Cubans and the influence of sugar production on it. He won the Prix Levallois with this project. Pierre-Elie is represented by the VU’ Agency. Published by Clémentine de la Ferronnière, 2014. Published by PapelArt – Serious Publishing, 2012.